Thanks to Matt Edwards and Amy Snyder of the Mount Airy Museum of Regional History for sharing the following image and story. Partnerships can help extend the reach of non-profits and shore up the weaknesses of individual organizations. Any staff member of a cultural heritage institution seeking grant money quickly learns the importance of organizational partnerships to boost the competitiveness of projects. For small museums, especially, partnerships are critical for any form of capacity building. And while cooperating with other cultural institutions is nearly always a win-win, sometimes the partnerships you can build in other sectors can be the most fruitful for accomplishing specific projects. Director Matt Edwards of the Mount Airy Museum of Regional History sets a great example for partnership building. 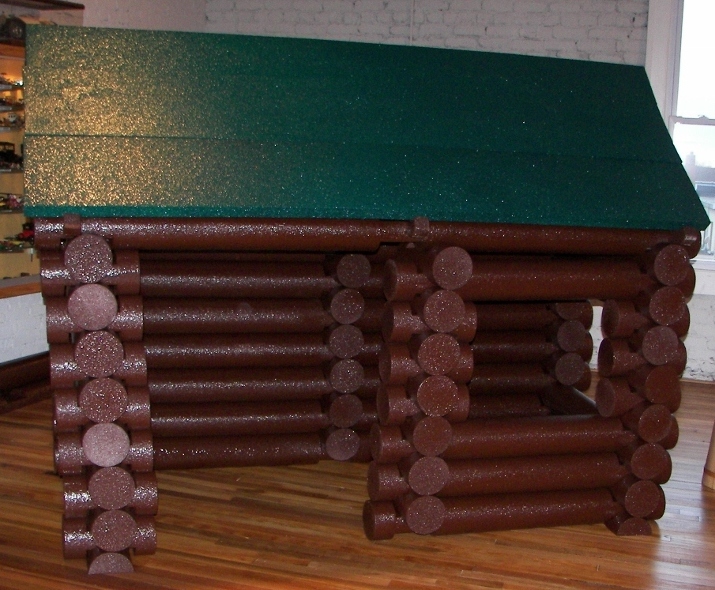 The above log cabin, made from coated ethafoam in the museum’s children’s gallery, is the product of one of many partnerships Edwards has built during his three years on the job. Edwards first got the idea during a visit to the Children’s Museum of Winston-Salem, where he encountered a similar structure. His research showed that such pre-fabricated foam cabins had been discontinued. Rather than give up on the idea, he reached out to two local foam factories, Hibco Plastics and NCFI, and spoke with the owners/ managers about producing a similar interactive for the Mount Airy Museum. Hibco’s owner took it from there, even going as far as notching the foam “logs” himself. NCFI provided the colored spray-coating before delivering them to the museum. The log cabin form relates to some of the museum’s interpretive themes and ignites both children’s creativity and their gross motor maneuverings. Moreover, it is an apt emblem for project-based partnerships between small museums and other businesses and groups within their communities. Like these partnerships, the cabin gets built, disassembled, and reconfigured all the time, depending on the vision of the builder. What community partnerships have been the most productive for your institution? What projects have you achieved that your institution couldn’t have completed alone? Posted on July 26, 2012, in Exhibitions, museums and tagged Amy Snyder, Children's Museum of Winston-Salem, exhibit interactives, Hibco Plastics, Matt Edwards, Mount Airy Museum of Regional History, NCFI, partnerships. Bookmark the permalink. Leave a comment.